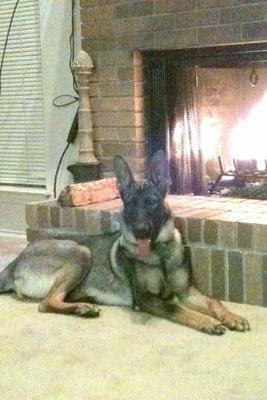 She is an 11 month old sable GSD, whom me and my husband just love and adore. I personally am in love with this picture because how happy and carefree she looks. But for just being 11 months old this little girl has had a rough first year of her life. When we first got this adorable pup at 6 weeks, she was covered with ticks all over her. That night we gave her a bath and found at least 20 ticks on this poor baby. Then around 4 months we took her for her shots but found out something that never crossed our minds, she had tick fever. Although I'm very thankful we found it in time it was still scary to think we hadnt even noticed signs of it and who knows what would have happened if the vet hadnt. So we started caring her for that then 2 months later I came home from work and brought her and our beagle in and found blood everywhere so I'm panicking trying to figure out where it came from when I looked down and saw it was coming from Austins foot, she nearly had cut her whole toe off!! I rushed her to the vet and she had to be put under get stitches stiches, she never cried or wimpered, such a brave little girl. Till this day I have no clue what cut her foot. So she had a cast for about 2 weeks then finally got it off and its healed up wonderfully. But a month after that she had something in her eye that was giving her a problem and so we gave her eye ointment to help it come off, but no luck. So we finally took her to the vet and they had to once again put her in surgery because it was stuck on her eye and giving her problems, this poor thing has been through so much but this is not the end of it unfortunately. Just recently she had to have surgery on her elbow, I know its very common in large, but she developed elbow hygroma, which is a fluid sac caused by repeatedly thowing herself on hard surfaces, kind of like a callus. What is sad though is that more than likely we will have to have the same surgery done on other elbow. But she just got out of that surgery this Monday and she is exhausted poor little girl. Now she is fine and running around like never before . Jumping on and licking everyone she sees. Such a happy and VERY FRIENDLY pup. But thank you for listening to this drawn out story of MY wonderdog Austin. Even though shes been through this she is still a happy go luck dog whom I'll cherish while shes here and never forget when shes gone. Shes my first GSD and I have fallen in love with the breed bc of her. I know you hear this often but even if she doesnt win shes the GSD of every day , of every month, and of every year of my life. Shes truly special to me in every way. Austin's story was truly very touching/heartbreaking. We recently became adopted by Liberty, a 10 month old GSD, our first of this breed as well. We'll never have another breed of dog. The entire family is in love with her and the story of Austin's loyalty and bravery (all that for a little pup!) is yet another reason we love GSDs! Your story really touched me. I have two GSD and know the stamina they have. Your dog has gone through alot but it is good to know that you are the right person for her in that you have given her all the care she needs. What a good mommy you are! Good luck with her and thank God for making the GSD. My 12 months old GSD Rambo, also had elbow hygroma, first on one elbow, and then on the other. What's interesting though is that he didn't have to have surgery. The vet drained the fluid (several times) on each leg. He is now fine and I hope he will never get the hygroma again.